Police have confirmed the body parts delivered to two Vancouver schools Tuesday were mailed from Montreal, and investigators believe they are linked to the gruesome dismemberment of a Chinese student in that city. Montreal police Cmdr. Ian Lafreniere told reporters Wednesday morning that the right hand and foot were packaged similarly to the left hand and foot mailed to Conservative and Liberal party headquarters in Ottawa last week. The addresses on the packages, which were delivered by Canada Post, are also similar to those found on the parcels sent to Ottawa. But investigators have yet to confirm the remains received at False Creek Elementary School and St. George's School belong to the victim in those cases, Concordia University undergraduate Lin Jun, nor can they say why the schools were targeted. "Why Vancouver, why two schools? We ask the same question: Why Ottawa, why two political parties?" Lafreniere said. All four deliveries contained notes, though police have not revealed the content of the messages. Lin's torso was also found last week in a suitcase outside the Montreal apartment of Luka Rocco Magnotta, the sole suspect in his murder. "We're missing one part now, which is the head. That could have been sent by mail, it could have been somewhere else, we don't know. At this moment we're still looking for that body part," Lafreniere said. The victim's relatives arrived in Montreal from China on Wednesday, and will be speaking with police. Police say they have yet to make any connection between Magnotta and the Vancouver schools. The suspect attended elementary and secondary school in Ontario, but may have hinted at a potential motivation for targeting Vancouver in a blog post he wrote called "How to Completely Disappear and Never Be Found." In the post, Magnotta outlines an in-depth strategy for leaving his life behind that involves selling off property, falling out of touch with friends and purposely misleading followers. "Sell your car in a different state/province," it read. "Choosing a near opposite path to the one you will eventually take to your chosen destination will help throw off anyone who decides to attempt to follow your footsteps." The latest packages were mailed west from Quebec to B.C. on an unconfirmed date. Magnotta travelled eastbound to Europe on a flight that boarded on May 26, three days before authorities launched an international manhunt to find him. In light of the latest evidence, Vancouver police said they are handing over their investigation to authorities in Montreal and will send the body parts delivered in B.C. back to Central Canada for forensic examination. The first box, containing the hand, was discovered at False Creek Elementary School at around 1 p.m. Tuesday, followed shortly after by the second at St. George's School. A statement issued by St. George's suggested the private school was randomly targeted. "There is no danger to anyone at the school, and our students are in no way affected by this matter. We are not aware of any connection of the package to the school," spokesman Gordon Allan wrote. The Vancouver School Board said Tuesday it would try to insure students were not impacted by the disturbing discoveries. Classes were let out at a normal time and resumed as usual Wednesday. Montreal police were put on alert Wednesday morning after what appeared to be a human foot turned up in the neighbourhood of Notre Dame de Grace, but Lafreniere said it was later confirmed to be a fake and possibly a movie prop. The commander said it was likely left on the street as a "very bad and sad joke," and the discovery wasted valuable police resources. Magnotta, an adult film actor, was arrested Monday at an internet café in Berlin and remains in custody. He has said that he won't fight his extradition back to Canada. 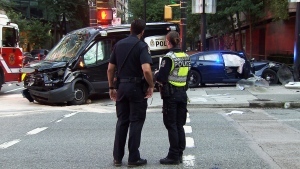 The Independent Investigations Office has wrapped up a 10 month investigation into a crash between a pair of Vancouver police vehicles that sent two civilians and three officers to hospital.